Local Trust - How can community organising help Big Local? Community organising is the work of building relationships and networks in communities to create social and political change through collective action. The community organising process focuses on reaching out to the most voiceless and marginalised. It begins by identifying what people care strongly about in their community through 1:1 conversations on doorsteps, in the street, pubs, and churches – the places where people meet. Organising is about working with people’s strengths but also about working with the frustrations and injustices that people feel about the world around them. Through holding systematic conversations and connecting individuals, organisers can help people use their collective power to unlock some of the barriers that communities can face when trying to win through with their agenda. Community organising has a distinctive focus on shifting power away from the institutions and into the hands of local people. Organising sees power being built and used in two ways: through organised money or organised people. In areas of economic deprivation the lack of financial resources is often what keeps the most vulnerable ‘powerless’ to create change. In the absence of financial resource, organising people and their collective resources enables communities to build their own power to act in their collective self-interest. Organised people with the resources that Big Local brings to a community can be a very powerful combination. Over the last four years Community Organisers in some areas have worked alongside Big Local partnerships to strengthen their activities. Community organising can add a much more personal understanding of the communities you live in: knocking doors, having 1:1 conversations, building trust, relationships and networks. The more conventional methods of engagement can often fall flat, with many voices never being heard. Organising offers an opportunity for communities to move away from the ‘usual suspects’ and unlock the real assets amongst us. The Company of Community Organisers can provide personalised training and support in Big Local Project areas. We have offered ongoing mentoring and support to connect groups with a wider network of people in their area, who have not currently engaged. 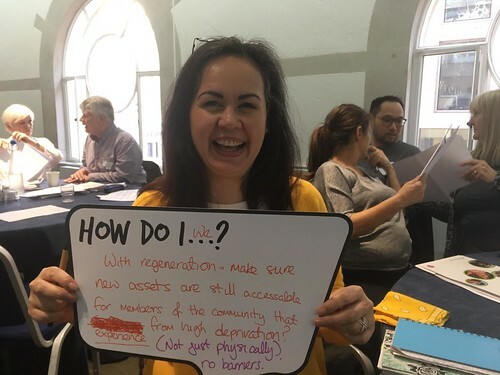 COLtd have also been participating in work around building stronger community based alliances of organisations, to bring about some of the bigger changes that they want to see from Big Local. One example of how community organising and Big Local can complement each other comes from the Dyke House community of Hartlepool. The Dyke House Big Local area in Hartlepool faces many of the difficulties seen in Big Local areas throughout England. It is within the top 2% of deprived wards in the UK and, as such, experiences high levels of unemployment, low levels of educational attainment and aspiration and high levels of health inequalities. The difference with Dyke House Big Local is that it has been supported since the beginning by community organisers. The Wharton Trust is a locally trusted organisation based in the heart of the Dyke House area. The Wharton Trust helps support Dyke House Big Local and saw the potential that community organisers could bring. The community organising process culminated in a truly different structure that is paying great dividends. Sacha added, ‘The organisers helped find local leaders that came together to form a partnership of 16 residents. Only three of those had been involved locally before.’ The partnership have named their Big Local Ten Years from Now. To find out more about The Company of Community Organisers and how they could help your area, visit their website.